Last week Sir Richard Branson and UPS authorised contractor in Lithuania – Vladas Lašas met up in an annual Forum One event in Kiev where the founder of Virgin Group was first introduced to Deeper™ Fishfinder created by Lithuanian tech startup Friday Lab. 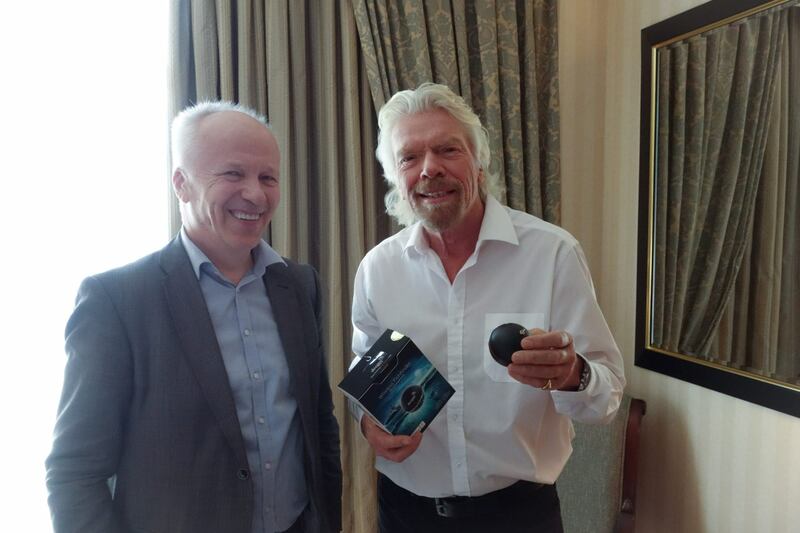 Chief executive officer and co-founder of UPS Lithuania, Vladas Lašas told his long time business friend Sir Richard Branson about Deeper™ while they were discussing most innovative Lithuanian startups. They met up at an annual Forum One Ukraine event in Kiev on April 30, which is the biggest business and leadership conference in Central Europe, where worldwide business leaders, visionaries, and international experts share their insights and ideas. Sir Richard Branson was introduced to Deeper™ Fishfinder as to one of the most innovative products not only in Lithuanian but also in the international fishing market. Vladas Lašas and Sir R. Branson discussed sonars features, it’s abilities to locate fish, get information about depth, water temperature and bottom contour. Both businessmen also shared some fishing stories and posed for a joint photo with Deeper™ sonar, held in their arms.